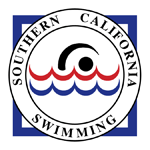 SCS is an LSC (Local Swimming Committee) serving Los Angeles, Orange, Riverside, San Bernardino, San Luis Obispo, Santa Barbara, and Ventura counties, plus the Southern Nevada counties of Clark, Esmeralda, Lincoln and Nye. Age group competition is administered by six geographic committees (Coastal, Desert, Eastern, Metro, Orange and Pacific) while championship competition and senior meets are administered by the LSC. Leading the nation that leads the world. Proud of our tradition, SCS provides support for our members in their pursuit of excellence.